For women trying to conceive, it is important to know which time of the month they are most fertile. This is why it is important that women can track their ovulation period since this will provide them the estimate when they can conceive easier. Still, there are some instances when women can still find it hard to track their ovulation period manually especially if they have irregular periods. Simply waiting for physical symptoms like cramps and breast tenderness as signs of fertility may not be experienced by all women. This is why this method of checking for your fertile days cannot be a guaranteed way of identifying the right period to conceive. If you and your partner have been trying to conceive and fail each month to do so, maybe now is the time to use an ovulation and pregnancy test kit. Ovulation kits measure the luteinizing hormone (LH) in your body that passes through your urine. Even though LH is always present, it increases greatly one to two days before your ovulation period. This marks the best period of the month to try and conceive. Some ovulation kits are limited for a week of use which cannot be sufficient for some women who are still trying to track their fertile period for the first time. This is why there are pregnancy test and ovulation kits like the Healthy Wiser Ovulation Test Kit which help women accurately and conveniently check their ovulation period and pregnancy throughout the month with ease. The Healthy Wiser Ovulation Test Kit is one of the easiest to use pregnancy test kit that can help women to effectively keep track of their fertile period. This is especially helpful for couples who are trying to get pregnant but are having a hard time to conceive due to certain circumstances related to difficulty in pinpointing a woman’s fertile period. Each Healthy Wiser Ovulation Test Kit contains 50 LH strips and 50 HCG strips. The Luteinizing Hormone (LH) strips will help you identify the period of each month when you are most fertile. This is because your body’s LH significantly increases during ovulation to release an egg for fertilization. By using ovulation strips, you can easily know the period when you are ovulating especially if you have difficulty in tracking your ovulation manually. On the other hand, the human chorionic gonadotropin (HCG) strips are meant to detect pregnancy as early as possible. The HCG appears in the urine during the early stages of pregnancy and can be easily detected by a pregnancy test. Both of the LH and HCG strips in this kit can accurately detect the period when you are most likely to conceive and when you get pregnant. The strips in these kit are 50 each and are easy to use. This is great if you have an irregular period and are really not sure when your ovulation period occurs. By simply immersing the strip in urine for 3 seconds, you can clearly read your results after 5 seconds. Fast and reliable! The Healthy Wiser Ovulation Test Kit is great for women who would like to track their ovulation period especially if they are trying to conceive. Women who cannot manually tell their fertile stage can benefit greatly by using one LH strip per day to determine whether they are near their ovulation period or not. Since this kit includes 50 LH strips and 50 HCG strips, you can use this kit to monitor your whole month’s cycle to better understand your ovulation period while also testing if you are pregnant. The Easy@Home Pregnancy Test Strips Combo Kit is one of the best-selling pregnancy and ovulation kits today. Costing a little more than the Healthy Wiser Ovulation Test Kit, it contains 50 ovulation test strips and 20 pregnancy test strips. The smaller number of pregnancy test strips is meant for testing after the ovulation period up to the week after a missed period. Another pregnancy and ovulation kit comes from AccuMed which contains 100 ovulation test strips and 50 pregnancy test strips. 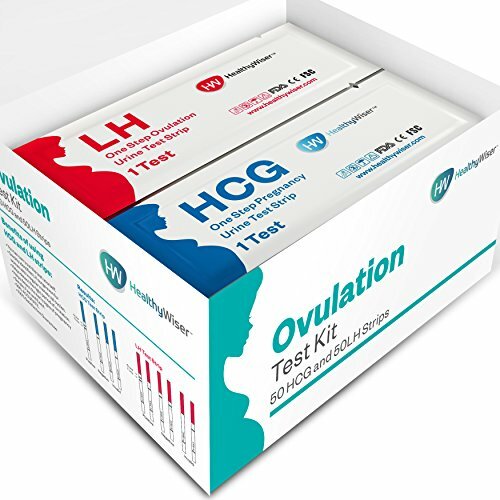 In the same way as measuring the LH and HCG hormones, this kit has a larger amount of ovulation test strips for women who aren’t too sure about their fertility period and would like to double check their results. The Healthy Wiser Ovulation Test Kit is a great purchase for women who are trying to conceive naturally by keeping track of their ovulation period. With an equal amount of ovulation and pregnancy test strips, you can check once or twice a day whether you are ovulating or have conceived already.